Nel mese di Aprile mi sono iscritta ad un “sew-along” (cuciamo insieme) del quale ho scritto qui. Ho pensato che fosse carino provare a cucire un cartamodello Burda -cosa che non ho mai fatto fin’ora, anche se ogni tanto compro la rivista. 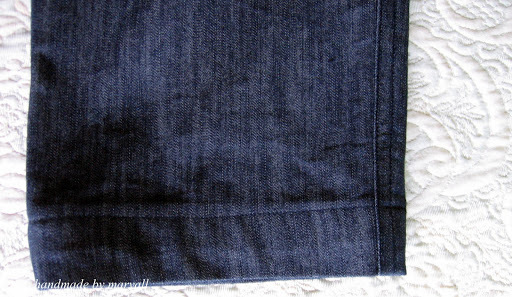 E soprattutto perché un paio di settimane prima avevo comprato altri 3 cartamodelli Burda in pdf, da http://www.sewingpatterns.com/ Uno di essi è Burda 7863 jeans skinny. E, quasi due mesi dopo, li ho finiti 🙂 Ecco qualche foto (fatte dopo averli indossati) – ricordate che io sono appena un’auto-didatta, principiante in quest’arte!! Almost two moths later, here are some pics I took after wearing them- keep in mind I’m just a self-taught beginner sewist!! 10-22 / 36-48. 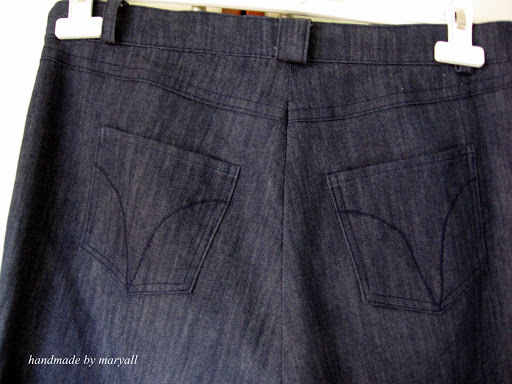 I sew a 42. – Did it look like the photo/drawing on the pattern envelope once you were done sewing with it? – Were the instructions easy to follow? – What did you particularly like or dislike about the pattern? I really liked not having to worry about adding seam allowances, or matching pieces. I can’t think about something I disliked. – Would you sew it again? Would you recommend it to others? 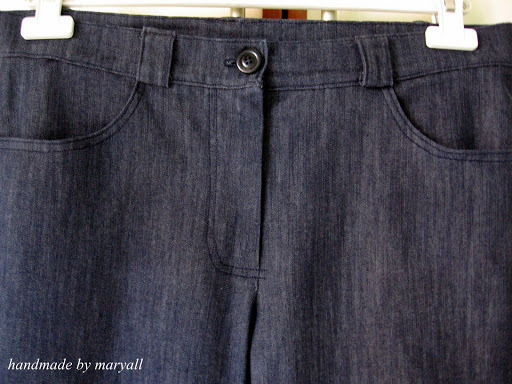 I would sew them again, this time with a few things in mind. As the pattern is designed for 1m68cm tall women, and I’m 1,64m, I would shorten the upper part and the legs at the suggested lines by one cm each, to compensate for that difference. 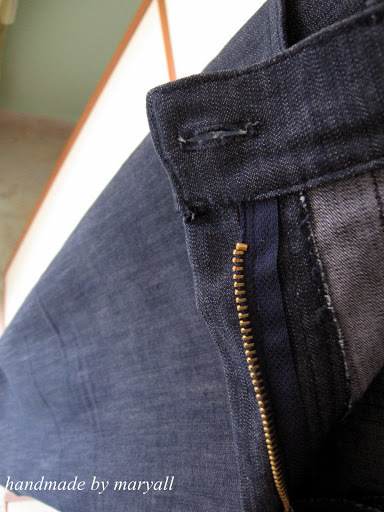 I would definitely recommend it as it is pretty easy to sew. 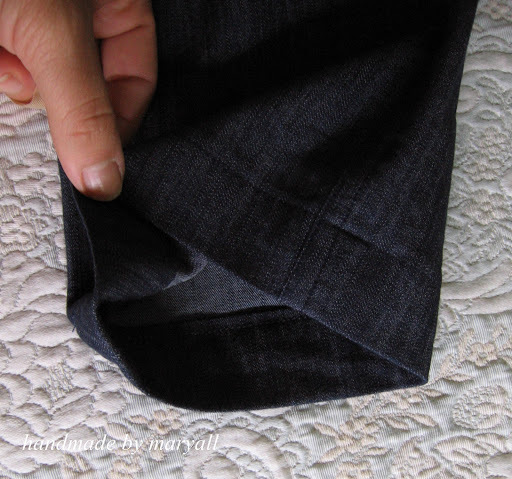 The pattern as well as the instructions are easy enough to follow, but as a beginner sewist I definitely needed to search for some sewing terms explanations. 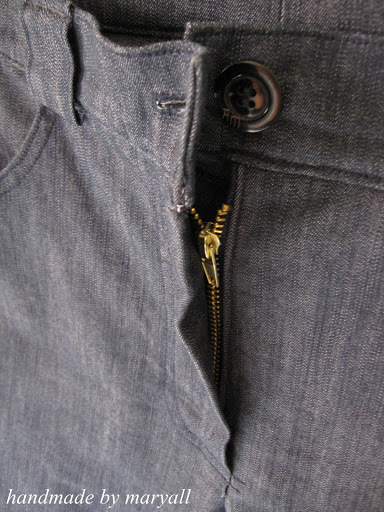 This project had a lot of firsts for me: first time sewing a pair of jeans, first time installing a metal zipper, first time sewing and decorating pockets. I’ve done an internet search for this pattern prior to sewing them, as I needed to know if other bloggers had issues (especialy fitting ones), or if there were things/tips I needed to know. One interesting tip was given by Carolyn at handmadebycarolyn. 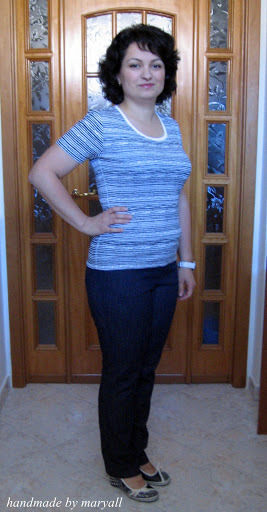 While everyone else in the blogosphere seemed to agree with Burda sizing for this pattern, she sew a different size for herself, because she measured the pattern with a pair of jeans that fitted her well. 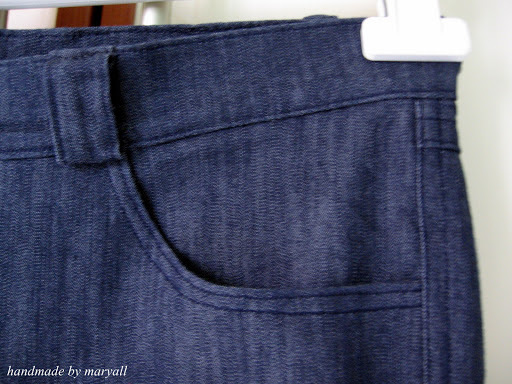 I followed her tip, and measured my favourite pair of jeans with the pattern, and I do have to say: “Thanks, Carolyn!”. According to the Burda table on the pattern, I was supposed to sew a size 44 (according to my hip measurement), but instead I sew a 42, and I’m REALLY glad I did! I would have ended up having a HUGE pair of jeans!! buy enough topstitching thread, so I don’t end up with using normal thread because the former isn’t enough!!! 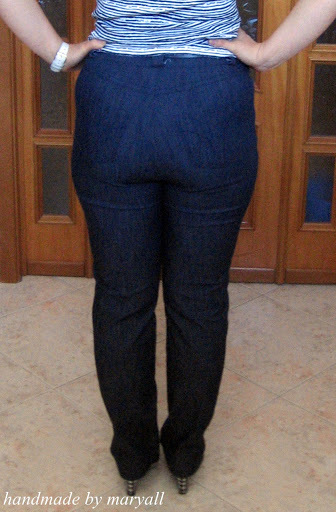 Ecco qualche foto con i jeans indossati. Sono comodissimi, mi sento bene e non mi devo preoccupare per la vita bassa che mi preme sulla cicatrice del cesareo oppure la schiena che resta di fuori, perché stanno al livello della vita ;). I pantaloni fanno qualche piega sul davanti, ma suppongo sia perché non ho accorciato la parte superiore, in base alla mia altezza. 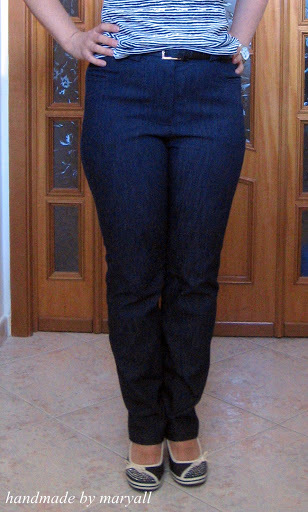 Here are some pics with the jeans on me; they’re so comfy, I feel great wearing them and I don’t have to worry about the low waist hurting against my C-section scar or about my back being uncovered, as they sit at my natural waist ;). They make some creases but I suppose they’re due to my lack of shortening the crotch. Non fate vedere la foto sopra ai bimbi prima di dormire!!! Devo assolutamente mettermi a dieta!!! Don’t let children see the above pic before they go to bed!!! I must absolutely go on a diet!! !